There is not just one cause of skin darkening. There are many different reasons. Some of these causes are more common than others. Also, some are more serious than others as well. Some of the more common causes for changes in skin color are illness, injury, and inflammatory problems. Discolored skin patches also commonly develop in a particular part of the body due to a change in melanin levels. Melanin is the substance that provides color to the skin and protects it from the sun. Skin can darken when there is an overproduction of melanin. Skin darkening can develop in people of all races and ethnicities. There is also a condition called melasma. Melasma causes increased skin pigmentation that usually occurs on sun-exposed surfaces of those with a darker complexion. It is much more common for darkened skin to appear in small spots. These small spots are called “age spots” or lentigines. Age spots are usually caused by sun damage acquired over a prolonged period of time. In fact, sun exposure is one of the most common causes of darkened skin. Skin Darkening can also occur as a result of hormonal change. Such as pregnancy or the use of birth control pills. 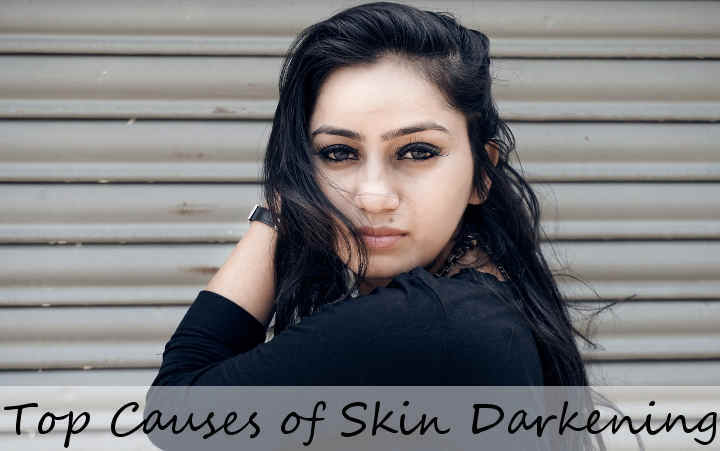 Darkened skin can also be a symptom of a disorder such as Addison’s disease, which is characterized by decreased production of hormones by the adrenal glands. Addison’s disease occurs when the adrenal cortex is damaged, and the adrenal glands do not produce enough of the steroid hormones cortisol and aldosterone. Darkened skin can also result from a combination of sun exposure and an allergic reaction, usually to a specific plant or chemical. This is also common when using certain acne medications that contain benzoyl peroxide and going out in the sun. This is called Photo-contact Dermatitis. Contact Dermatitis is one of the tamer causes of skin darkening and is easily treatable. This condition occurs when chemicals you come into contact with cause an undesired reaction. If you ever used a new face product or laundry detergent and suddenly became itchy and irritated, it was most likely contact dermatitis. Once you stop using the product, the itchiness should subside. Until then, put some anti-itch cream on the infected area. If the problem persists, go see a doctor. Ringworm is an infection caused by a fungus and actually has nothing to do with worms. Its name comes from the small, ring- or circle-shaped rash that appears on the body due to infection. In ringworm of the body, the rashes appear on skin regions except for the scalp, groin, palms of the hand, and soles of the feet. The condition is common and highly contagious but is not serious. See your doctor, and they will probably provide you with an over the counter antifungal topical. Eczema is a very common skin condition. Though it is common and not dangerous, it can be quite uncomfortable. The condition causes itchy and inflamed patches of skin. It can flare up, subside, and then flare up again. A dermatologist, allergist, or primary care physician can help you identify the correct treatment for eczema. If you develop symptoms of tinea versicolor, you can treat the condition yourself. Over-the-counter antifungal medications can help. However, you should contact your doctor if these treatments aren’t effective. You may need a prescription medication to control your symptoms. More often than not, skin darkening is not a cause for alarm. It could be an allergic reaction, a reaction to a product, or another treatable condition like ringworm. However, if you have skin discoloration and additional symptoms such as fatigue, loss of appetite, sudden depression if the darkened areas are also occurring in your mouth, diarrhea or constipation see your doctor as soon as you possibly can. It could be something more serious.